Though many people living in the city take sewer systems for granted, if you live in a rural location you’ll know only too well the importance of septic tanks. Where there’s no mains sewage to connect to, homes need a septic tank fitted. This provides a place for baths, toilets and dishwashers to drain into. They need emptying at least once a year depending on their size, and are an essential component of any drainage set up. If you’re looking into septic tank costs, there are five main factors you need to consider. Each of these can affect the price for both the installation of a new system or the replacement of an old tank. As you might expect, the size of your tank will have a direct effect on the cost. It’s essential to remember that septic tanks don’t only take used toilet and bathroom water, but wastewater from washing machines and dishwashers too. All wastewater from your home will be draining into one of these tanks, so you must have a tank fitted with adequate space. For example, too small, and you’ll discover you need to have the tank emptied more frequently, pushing maintenance costs up. However, a large unit not only costs more, both for the product and its installation but can also limit the number of tanks to choose from. This is because larger tanks normally need to be installed below ground. 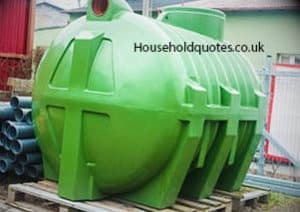 Overall, a medium or large septic tank should cost between £650 and £1,200, though other cost factors can push the price higher. The location of your septic tank will have an impact on the installation costs. Above-ground tanks are normally cheaper and are great if you only need a small system. They’re also cheaper to install. However, they do require emptying more regularly, and over a tank’s lifetime, this can be expensive. Alternatively, you could research having an underground tank fitted. These aren’t cheap, largely due to the installation costs, which include having to dig a hole large enough to contain the tank in, and prepare the right footings. However, on small sites, you may have no other option than to buy a below-ground tank as space on the surface may be at a premium. You should also check local regulations before buying your tank as some councils restrict the variety of septic system you can use. Draining systems are required for below-ground tanks, and setting this up may also add to initial costs. The benefit of a large, underground tank is that a soakaway can be fitted, allowing some of the wastewater to be filtered out into the surrounding ground. As a result, your tank is able to be emptied less often, saving you money in the process. Of course, before you have a tank fitted, you will need to ensure the ground is suitable for a soakaway and will be able to absorb some of the excess water. Getting this checked over and having any required pipe and drainage works installed will push up the project’s price. The cost of septic tanks are also affected by the material they’re made of. Unsurprisingly, the better quality materials are more expensive, but if you can afford the initial outlay, it’s worth paying a premium because the tank will last longer. Some of the cheapest tanks are made of concrete, for example. Whilst this allows you to buy an inexpensive septic system, they don’t last long and you’ll have to replace them regularly. Alternatively, a high-density polyethylene model, though costing a lot more initially, will last far longer and is more financially economic. Finally, labour will have a huge impact on septic tank installation costs. For example, the average cost of having a new tank fitted is between £1,200 and £1,800. This can be a lot more if you’ve decided on a large-than-average tank. Likewise, if you’re having a tank replaced, you’ll need to factor in the cost of having the old septic system removed. Luckily, this is an area you can save some money on. It’s relatively simple to dig a hole, and the cost of hiring a digger will be far less than having a professional team install the tank. If you have some basic plumbing knowledge, you could even install the entire drainage system yourself. Alternatively, use a website like Quotatis to negotiate installation costs with local contractors. Overall, the average septic tank system can cost just over £2,000 to buy and have installed. You can save money by preparing the site yourself, but it’s worthwhile buying the best tank possible for future savings.